View on Osaka, ca. 1918 (Taisho 7). From right to left (mostly Nakanoshima): Osaka Hotel, Osaka Court of Appeal (大阪控訴院, Koso-in), Osaka Central Public Hall (中央公会堂, Osakashi Chuo Kokaido), Osaka Library, Bank of Japan, Umeda and Fukushima. This is card number 1 of 7 from a series of postcards showing a 380 degree view of Osaka (Osaka Ichibo). The photographer stood on the roof of the Mitsukoshi Department Store on Sakaisuji. 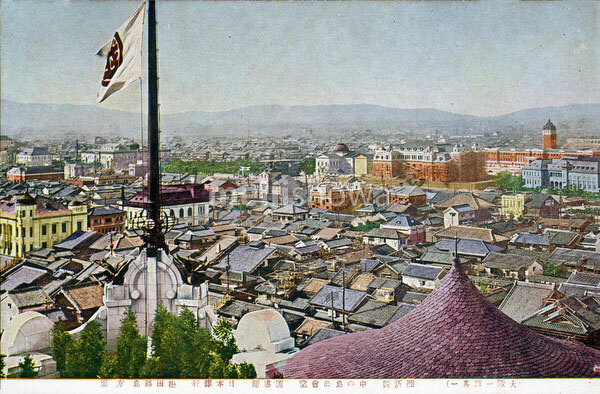 There is scaffolding on the Osaka Central Public Hall, which suggests that this photo was shot in 1918 (Taisho 7), shortly before the building was opened.